"WE WANT YOU HAPPY - SO YOU WILL COME BACK"
****2019 Update - We have fiber optic wireless internet with a data port and unit phone. VERY FAST! ****2019 - New Beds and furniture. This nicely decorated, roomy three bedroom, three bath, Gulf-Front condo is the perfect retreat for all! Couples will be enticed by its choice location on miles of non-crowded, sugary-white sand beaches directly on the Gulf of Mexico. It’s great for viewing the spectacular sunsets. Families with children will have endless fun riding the waves, building sand castles, and splashing in the pool. Tranquility and relaxation will be enjoyed by seniors and those just needing to 'get away' from it all. Come experience the peaceful easy feeling you get while gazing off the Mexican tiled balcony at the crashing waves and breathing in the sea air. You'll notice the great top-quality balcony furniture. Harbour Place is convenient, fun, and secure. It is in close proximity to the many local attractions, restaurants, shopping, golf, amusement parks, water sports, boating, fishing, and more. All Orange Beach marinas and marina restaurants are nearby and our outside parking lot is big enough to park your boat. Cotton Bayou, which includes a public boat launch, is approximately two miles from the condo. Built in 1999 and completely refurbished in 2005, it is only a 5 story building with only 65 units, no-wait elevators and quiet secure indoor hallways. It has covered, and uncovered parking. The indoor/outdoor swim-through pool is heated when necessary, and along with the indoor hot-tub, faces the Gulf. There is a shaded deck, adjacent to the pool, which is perfect for picnics. This Harbour Place condo is a south-west corner unit and is located on the Second floor with a balcony that overlooks both the pool and the Gulf of Mexico. You will find one of the two 'no wait' elevators directly outside our front door. Ride down one floor, and you are only steps away from the beach. The living room is decorated in beach cottage fare. It has a queen sleeper sofa, TV, VCR, DVD and great views of the Gulf. The colorful kitchen has ceramic tile and is fully-equipped. It also includes a laundry closet with a new 2019 washer and dryer. The master bedroom is irresistibly romantic with its direct beachfront ocean view through large windows. It has a king-size bed, HD smart TV. Bedroom #2 is decorated in cheerful tropical beach fare with shells and sea life. It has a queen-size bed and HD TV. The third bedroom has hues of blue. It has two full beds, a HD TV. All three bathrooms have tiled showers, and the middle one has a tub unit. A keyless keypad (needs owner provided 4 digit keycode) is integrated into the front door handle. We are sure you will enjoy your stay and make some wonderful memories! Check-in is at 3pm. Check-out is at 10am, unless otherwise stated. This is a no-smoking unit. - Easy Access - No-Wait Elevators or Simply just up 1 Flight of Stairs. This unit is the easiest access in this building. All bathrooms have granite counter-tops that uniquely extend over the toilets, which gives you much more room. Private beach is for Harbour Place Condominium guest only. You can rent beach lounge chairs with cushions. Very close to pool and beach. Ideal for young and old access to beach fun with minimal effort. Best view of the beach on the coast. This building is one of the closest to the oceanfront in the area. Your view of the ocean is NICE! Great location and condo. Owner was very responsive and onsite maintenance did a great job of keeping the facility clean. Close to all the local attractions and restaurants. We loved our stay and can’t wait to come back again! Stayed at Harbour Place with family and friends. Great location and very nicely furnished. Owner was great communicating and answering all questions. Will definitely stay here again. Didn’t want to leave. Thank You Vicki - great to hear your stay was good. When you go on vacation to the beach you want it right, we know that and try really hard to make it special. Hope to have you back next year. Take care and nice working with you. Had a wonderful week with great weather. Food was delicious every where we ate. Steps from beach, beautiful home, nice pool, helpful owner! Teresa, thanks for staying in our beachfront condo. Good to hear everything was nice. We try hard to make your stay the right place and the process easy. Hope to see you back next year. A great condo, very clean and comfortable. Great view. We really enjoyed our stay there and will be doing it again. Thanks Peggy, we appreciate you staying with us and hope to see you again next year. We try hard to make the condo like a place we would like to stay. I love the keypad entry - no keeping track of keys. The condo is really spacious and beautiful - the 3rd bathroom is a little tight but workable. 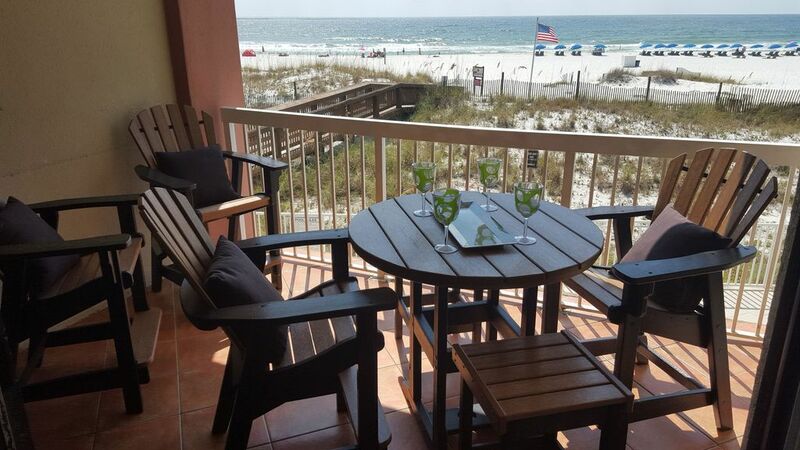 The balcony furniture is great and makes it so easy to see over the railing to the beach/ocean. This is the 3rd year we have stayed at Harbour Place and this was one of the best experiences my family (5 adults and 1 child) have had so far. Wallace was prompt to get back to me with a minor problem (we had been given the wrong code for entry) and also when the ac quit working it was promptly repaired (as we went out for lunch). Beds were comfortable but bedding is very basic so if you have a favorite blanket/pillow be sure to bring it along. There were umbrellas and boogie boards in the closet which was a nice addition. We brought along our Switch and it was easy to plug in to the television in the main room. The kitchen is nicely appointed with everything we needed (I don't cook at lot on vacation) but it was there if I would have wanted to do so. Noise is really minimal - we had one night that some young men were fairly loud as we sat on the balcony but when 10 o'clock came around and the pool closed it was blissfully quiet. My grandson loves the "cool pool" as he calls it and the water was always great! It was fun to watch people go to the beach crabbing at night and to see the beach patrol come by from out balcony. This beach is full of beautiful shells and the sand is really nice. I rented an umbrella and chaises this year and it was well worth it to me not to have to carry those things to the beach. Overall, I would highly recommend this condo for anyone who loves the beach and ocean! Thank You Pam, glad to hear your stay was great. It is a special place. We take a lot of pride in maintaining our building. We try to make the unit a place we as owners would like to have a nice vacation. Hope to see you next year. Other Activities: boating, miniature golf, state park trails, lakes and hiking across the street. FRESH STEAMED SEAFOOD across the street. Down payment due at booking and full payment required 30 days before arrival. Damage deposit returned after maid cleans.